Hockey’s ‘narrative’ depends on no-one questioning his assertions. Question. The answers will shock you. 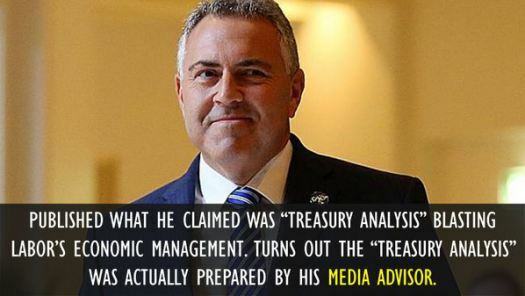 The Budget spin of Australian federal Treasurer Joe Hockey has entered the world of fantasy. It’s a world where fantastic imagination, lies, obfuscation, bull-dust, half-truth and distortion gets mixed in a muddle — all designed to blind-side the voters. Sometimes it blind-sides the news media. Sometimes some of the news media get sick of the deception, get sick of being played for fools — and let rip. This is a story about such an occasion. Some mistakes were made along the way. Let’s begin with this meme, circulated on Twitter on Thursday, April 3, 2014. It’s WRONG! Well, half wrong. The reference to “Treasury Analysis” is wrong. ← Are We Entitled to be Bigots?